A Chilean court has rejected the second of two extradition requests for former Argentine President Carlos Menem. Judge Jaime Rodriguez Espoz said he could not agree to the request, as Mr Menem was not on trial in Argentina and had no previous conviction there. 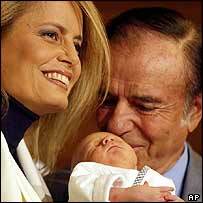 Mr Menem - who led Argentina for 10 years until 1999 - has lived in Chile with his wife for several months. The Argentina authorities want to question the 73-year-old in cases of alleged fraud and illegal enrichment. The latest extradition request regards investigations about $60m allegedly embezzled from funds for two new prisons. Last month another Chilean judge rejected the first extradition request by an Argentine magistrate who wanted to question Mr Menem over $600,000 allegedly paid into a Swiss bank account. The request was rejected on the same grounds - under Chilean law, the judge said, people cannot be extradited on mere suspicions or for questioning.